Norse myth tells how Thor went fishing for the Midgard Serpent, using an ox-head as bait. He caught the serpcnt, but pulled the fishing rod so hard that his heels punctured the boat deck and dug into the sea bottom. Thor gripped his hammer, poised to smash the serpent, when the boat captain – Hymir the Giant – cut the fishing line to avoid catastrophe. 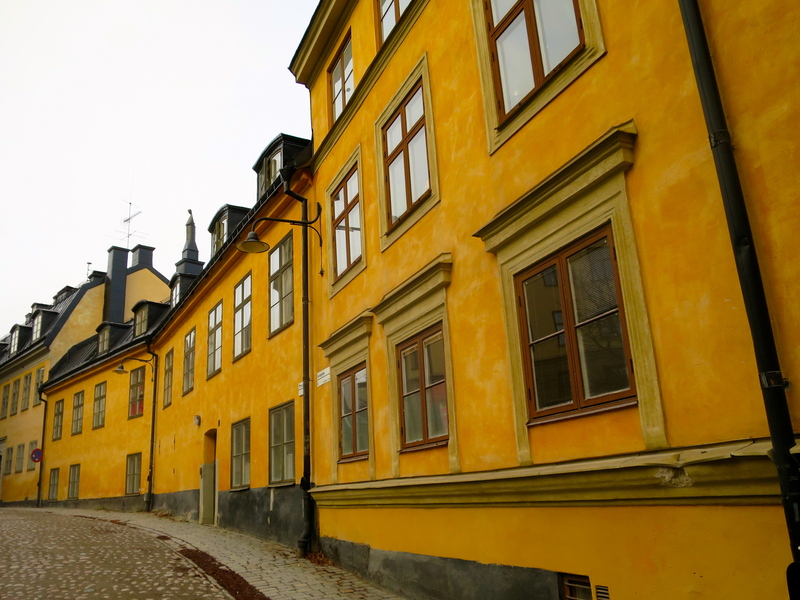 I read this story after flipping to a random page in a book about Sweden’s capital – Stockholm – in the Papper Bookstore (“Uncommon Guide Books”). 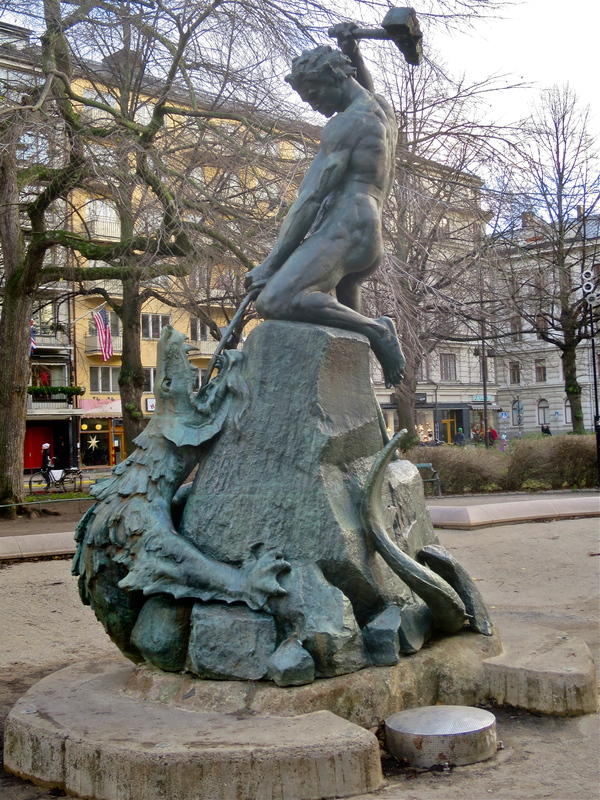 Outside, in Mariatorget Square, I found a statue depicting this story. 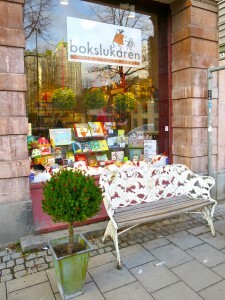 The small bookstore includes an intriguing mix of titles by various authors – Beatrix Potter, Gerald Durrell, and Edgar Allan Poe (in English) to Marcel Proust in Swedish. 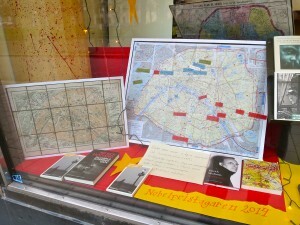 The shop front includes Parisian maps to help celebrate the story of the 2014 French Nobel Literature laureate Partrick Modiano. Across the square (on the other side of Thor hacking the slimy beast) is a bookstore / cafe combination – for children’s books (and yummy lattes for Mom and Pop). Not too far away at a Christmas Market in the train station is a bookstore dedicated to trains. Really. And customers flock to fork over their cash. 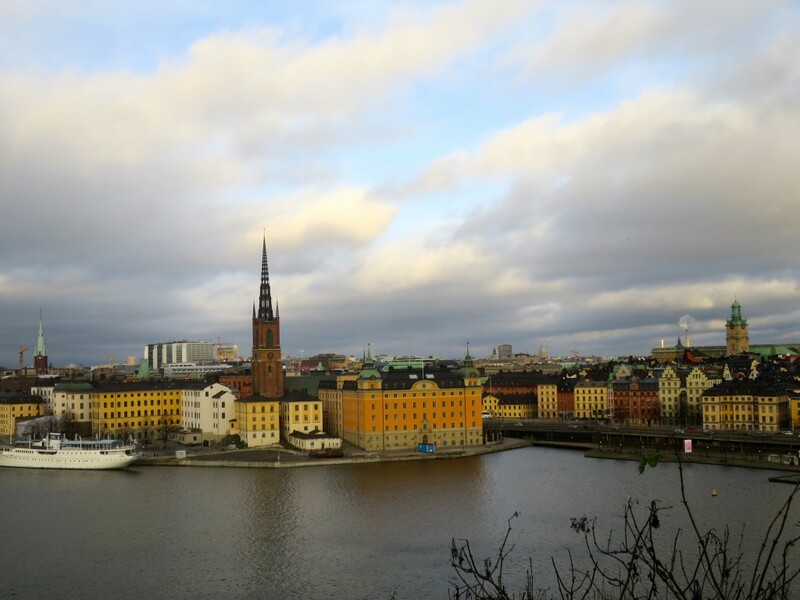 While walking around Stockholm, you see metal signs about the “Literature Trail” telling about authors associated with the city. Not exactly being hip in speaking Swedish, I lost the trail. But it’s key for highlighting local pride in celebrating writers and writing. The printed word is still huge in Sweden. Small bookstores keep alive by focusing on niche marketing that addresses the needs of target audiences interested in specific subjects – travel, children’s stories, trains. And locals are hungry for it. This year was also the first ever Stockholm Art Book Fair. 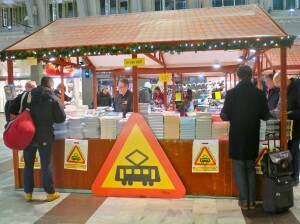 Sure – ebooks are catching on and growing in popularity – but printed titles still rage in Sweden. Stieg Larsson, author of The Girl with the Dragon Tattoo (and the Millennium Trilogy) was tech savvy and computer literate, but also a devotee of traditional print journalism. In an age when electronic media flourishes, it’s refreshing to see – in a country that aggressively embraces internet technology – that there’s a healthy regard for the value of the printed word.